If you come upon small oblong pellets on your floor or counter that resemble black rice, you might have just found mouse droppings. The feces are most abundant near feeding and nesting spots. If you spot them, be careful. Rodent feces can emit harmful particles of disease if disturbed, so do not stir them up with vigorous sweeping or vacuuming. Instead, pick them up carefully with gloves and a paper towel, then dispose of them in plastic bags. Make sure to disinfect the entire area. Mice stick to their favorite traffic routes around your home. In other words, they generally run along the same walls and baseboards night after night. Look for a path of dirty smudges on the floor where mice have left grime from their fur and feet. This is a sign of a high-traffic rodent highway. Has your dog food or bird seed bag suddenly sprung a leak? Mice chew their way into all kinds of boxes and bags to get to their favorite grains and cereals. And they seldom clean up after themselves. Check for holes in bags and small trails of crumbs around food containers in your pantry. If you left butter or bacon fat out on the counter, inspect it closely. You may see tiny teeth marks in it. Make sure to throw out any food that the mice got into. Mice love finding a cozy spot to rest and give birth to young. For example, they love the warm area behind the refrigerator or the stove with a pilot light. And they also like to nest in the back of cabinets and pantries. They gather shredded paper, torn cloth, food wrappers, stuffing from pillows or mattresses, and insulation into a ball and then live inside it. If you notice holes in fabric, or see see a small clump of material in a corner, with or without droppings nearby, you could have mice. Hearing that pitter-patter over your head can be relaxing on a night when meteorologists called for heavy rain. Not so much when these sounds occur every night, and not just over your head, but in the walls and all around. Pay attention to where you hear scratching and scampering, as that area is likely close to the source of your problem. You might catch a whiff of their musty presence. It could be a nest, a dead mouse stuck somewhere, or rodent droppings. But even if your nose doesn’t take notice, your pet’s might. For instance, if your cat is suddenly intrigued by a certain corner or part of the house, he or she may have found the site of the rodent problem. 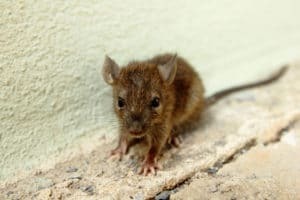 Unless you are prone to hallucinations, the sight of a mouse in your home is usually a good indicator that you have at least one mouse in your home. Spotting them in various forms is a tip-off that you’re harboring more than one. For example, if the mouse that looks gray one night, brown the next, big one day, small the next…chances are, it’s not the same mouse. Consider the mouse’s reproductive habits. Female mice can give birth 10 times per year, with an average of six to eight mice per litter. Did you do that math? That small problem can escalate quickly. Are you unsure about the presence of mice in your home? Or have you confirmed rodent problems but aren’t sure how to proceed? Then contact Green Pest Solutions. Our team of exterminators have gone through specialized training to address rodent problems, contain them, and prevent future infestations. So call us today at 877-636-9469.